Writing very bad poetry requires talent. It helps to have a wooden ear for words, a penchant for sinking into a mire of sentimentality, and an enviable confidence that allows one to write despite absolutely appalling incompetence. 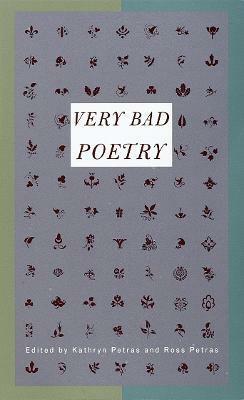 The 131 poems collected in this first-of-its-kind anthology are so glaringly awful that they embody a kind of genius. From Fred Emerson Brooks' "The Stuttering Lover" to Matthew Green's "The Spleen" to Georgia Bailey Parrington's misguided "An Elegy to a Dissected Puppy," they mangle meter, run rampant over rhyme, and bludgeon us into insensibility with their grandiosity, anticlimax, and malapropism. Guaranteed to move even the most stoic reader to tears (of laughter), Very Bad Poetry is sure to become a favorite of the poetically inclined (and disinclined). Kathryn and Ross Petras are a brother and sister team who wrote The 776 Stupidest Things Ever Said. They live in New York City.